Among the names contained in the Panama Papers, the enormous trove of confidential documents revealing how the world's elite exploit tax havens, is Alaa Mubarak, son of deposed President Hosni Mubarak, and other associates of Egypt's former autocratic leader. Hosni Mubarak was ousted in the 2011 Egyptian revolution, also known as the January 25 revolution. He and his sons were tried and convicted on corruption charges in May 2015. While Hosni Mubarak remains in prison, his sons Alaa and Gamal were released in October. The Panama Papers documents are from Mossack Fonseca, a Panama-based law firm that helps clients set up offshore shell companies to stash their money abroad, sometimes to illegally hide their money from tax authorities at home. In one leaked letter to the director of financial investigation agency in the British Virgin Islands, Mossack Fonseca listed Alaa Mubarak as the owner of Pan World Investments company, established in 1996 and registered at his London address. The inclusion of Alaa's name as well as the names of other associates of Hosni Mubarak in the Panama Papers were greeted on Egyptian social media by some as further confirmation of the popular uprising in 2011. Every day I become even prouder of taking part in the great January revolution that toppled a corrupt regime. The Panama Papers exposes the regime's dictatorship and reveals the corruption of many who rule in the region. 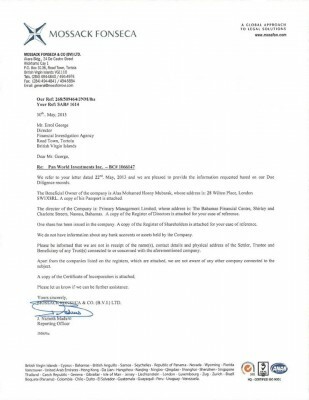 The letter in which Alaa's name appears also reveals that the director of the company is another company named Primary Management Limited, which is registered at an address in the Bahamas. According to the leaks, the British Virgin Islands authorities, famous for being a tax haven resort, decided to freeze Pan World Investments activities, calling Mubarak a “high-risk” client. A letter leaked from the Mossack Foresca on Alaa Mobarak's property in the British Virgin Islands known for tax havens. The Panama Papers also reveal a list of Egyptian names owning shares in a company registered in the Caribbean Cayman Islands, another tax haven, under the name Egypt Fund Ltd Inc. A quick examination of the list, posted on journalist Osama Diab's Facebook account, shows individuals that were either part of or closely tied to Mubarak's regime. In addition, the list includes major banks owned by the government — Banque du Caire and Bank of Alexandria — as well as big companies like Cellelia Assets Corp., owned by Hussein Salem, who was said to be close to the Mubaraks and who fled Egypt following the 2011 uprising. Also featured are steel tycoon Ahmed Ezz, who was charged with political corruption and monopolistic practices in major convictions following the revolution and was subsequently released on bail, and Orascom Investment and Development, owned by the wealthy Egyptian Sawiris family. The fact that the Mubaraks had holdings abroad wasn't a secret. In March 2013, EIPR-British Cornerstone research uncovered Hosni Mubarak's ownership of Cyprus-based companies and four bank accounts tied to Bullion Company. 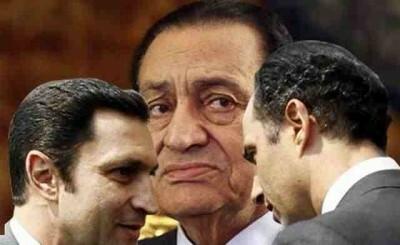 A month later, EIPR and British Cornerstone addressed the European Commission urging it to freeze the assets of Mubarak and his associates in Cyprus. They also demanded that the British Virgin Islands freeze the Mubaraks’ assets on their territory including Pan World Investments. مهم جدا واحنا بنتكلم على #وثائق_بنما ما نقولش اموال الدولة ! لا نقول اموال الشعب ! دي اموال الشعب حصيلة انتاجه وضرايبه اللي بيدفعها ! It becomes important not to say “the money of the state” when we refer to the Panama Papers. We should say “the money of the people”. This is the outcome of the people's production and taxes they pay.